Welcome to my state, New Jersey, home to crowded highways (with countless exits), billowing smokestacks and a treasure trove of jokes (and truisms) illustrating a certain incivility (sarcasm if you will). Now allow me to introduce you to another side of the nation’s most densely populated state: it is a wine-loving restaurant-goer’s paradise. You see, thanks to the state’s antiquated beverage alcohol laws, the availability of “on-premise” licenses never kept up with the inevitable shift in population toward suburbia. As trains and cars drew people away from New York City, liquor licensing sat pat, leaving scores of thriving communities seriously under-served in terms of restaurants permitted to sell wine alongside their thoroughly engaging cuisine. The bright side of the Dark Ages laws, however, is that a specific clause permits customers of unlicensed New Jersey restaurants to consume their own wine and beer unless there is a local ordinance prohibiting it. Legally, no cover, corkage or service charge can be imposed. That’s right: all over the Garden State, you can bring your own wine and pay nothing. 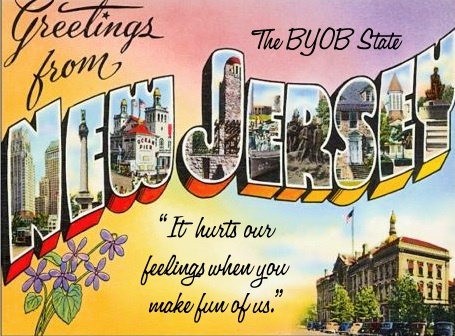 So, when wine lovers in New Jersey say “YO!” they may well be referring to BYOB. Living here, I sometimes take for granted the luxury of enjoying a bottle of my own wine when dining out. I am quickly snapped out of this complacency by a night out in Manhattan where I can pay upwards of $12 for a glass of wine—in other words, roughly the starting cost for a decent bottle at retail. But back home in Montclair, a town just twelve miles west of New York City and well known for its abundance and concentration of restaurants: 115 restaurants into 6.3 square miles—among them are some of the best BYOB’s in Jersey. I can simply choose a nearby destination to fit my culinary mood and bring along a bottle or two that I know will pair nicely with items on the menu. 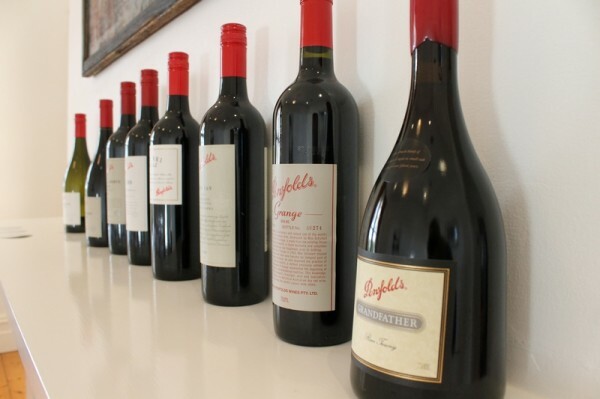 Alternatively, diners can take advantage of nearby wine shops to snag a bottle or two. I was fortunate for nearly two years to be part of the Montclair BYO culture on a daily basis. Not by dining out every night, but rather by working at Amanti Vino, a local wine shop situated in the epicurean center of Montclair. In this capacity I spent many a dinner rush helping customers with wine-pairing suggestions for everything from Ethiopian to Cajun Creole and soul food. Bring it to Restaurant Blu. Chef Zod Arifai is a veteran of Bouley and Aureole in New York City and Charlie Trotters in Chicago. His take on New American cuisine features plenty of fish and lighter meats. Bring it to Culin Ariane. Chef Ariane Duarte (Top Chef season 5 contestant) and her pastry chef husband Michael combine the flavors of Europe and Asia to a menu of eclectic Modern American. Bring it to Thai Chef. Chef Veera Premon, formerly of New York’s Tavern on The Green, adds a modern flavor to his Thai and French cuisine. Bring it to Fascino Restaurant. Chef Ryan and the DePersio family raise the bar for contemporary Italian cuisine not just on the menu, but also in ambience and service. Bring it to Restaurant Passione. Chef Mike Carrino, winner of the Food Network’s Chopped, honed his skills at high-end resorts before opening this classic French restaurant. Bring it to Mesob. Two sisters Berekti and Akberet Mengistu prepare authentic Ethiopian foods like stewed lamb with exotic flavors and textures—all served communal style with traditional spongy sourdough bread (injera) instead of forks. And here are five more great NJBYOBs. Note that these cover South, Central and North Jersey, including two among New Jersey Monthly’s top 25 in state. New American “Locavore” Bistro featuring locally sourced, seasonal ingredients. Latin infused Spanish and Portuguese cuisine in an upscale but friendly setting. Franco-Italian with a hint of Asian served in an upscale casual setting. Superb traditional sushi and cooked dishes in a tranquil setting. Authentic Northern Italian cuisine and wood-fired pizza. Tasting menus available. Yes, in case you are wondering, the law allows unlicensed restaurants to supply the glasses. And in my experience, the wait staff (whether they are legally permitted to or not) opens the bottles, even stopping by the table periodically to refill glasses or to check that the ice bucket they have supplied is adequately chilled—an arrangement that I find is so wholly reasonable and civilized that it might help the outsider to “fuggetabout” whatever unflattering notions they once had about New Jersey. And to top it off, if you don’t finish your bottle with dinner, you are welcome to doggy-bag it home. — Sue Guerra holds the WSET Advanced Certificate in Wine and Spirits and is currently pursuing her Diploma. She blogs about wine for New Jersey Monthly Magazine (www.njmonthly.com/blogs/on-the-vine) and does private and corporate wine events focused on education in her home state of New Jersey. Knew about the high concentration of diners but not about the equally dense BYOB scene…until now. Hey, it’s makes a case to take a detour into New Jersey. Thanks for the post! What an interesting post! Usually we think of laws as somehow denying us a pleasure, or curtailing our activities. Here is an example of a law that benefits the consumer by providing lower costs and flexibility. Maria: I never really distilled it down to that but you are right. And for my part I am totally spoiled by the BYOB scene here! Good Article. As a South Jersey resident, and author of the SOUTH JERSEY WINE BLOG (WWW.BALLYMOTE.WORDPRESS.COM), I am also grateful for the abundance of excellent BYOB’s in our state. Naturally, being from the much-neglected southern part of the Garden State, I feel our BYOB’s would stand up well against the best of North Jersey. It would be fun to work out some kind of North vs. South Challenge where all of the diners and wine drinkers who participate end up being the winners. greetings, perhaps this post is really a bit off topic but in any event, I have been searching your web site thats why looks truly tasteful..I’m resulting in a new blog and im sure hard-pressed to make the item appear great, and supply high-quality content. I have learned plenty here and I watch for more updates and can be returning.